The comedians present a stage show written by and starring their characters Gil Faizon and George St. Geegland. Fri 3/18-Thu 3/24: 7:30 PM, Athenaeum Theatre, 2936 N. Southport, athenaeumtheatre.org, $60. The last time Gil Faizon and George St. Geegland came to Chicago they were selling hot dogs to police at the Democratic National Convention of 1968. They're a pair of self-proclaimed "racist liberals" who met in Toronto while dodging the draft during the Vietnam war, and they bonded over a shared love of wearing turtlenecks with blazers. 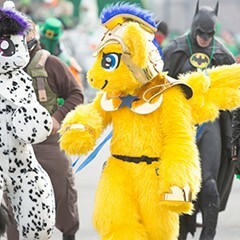 That's the basic story of these two characters, or at least it is according to their creators, comedians Nick Kroll and John Mulaney, the latter a Chicago native. 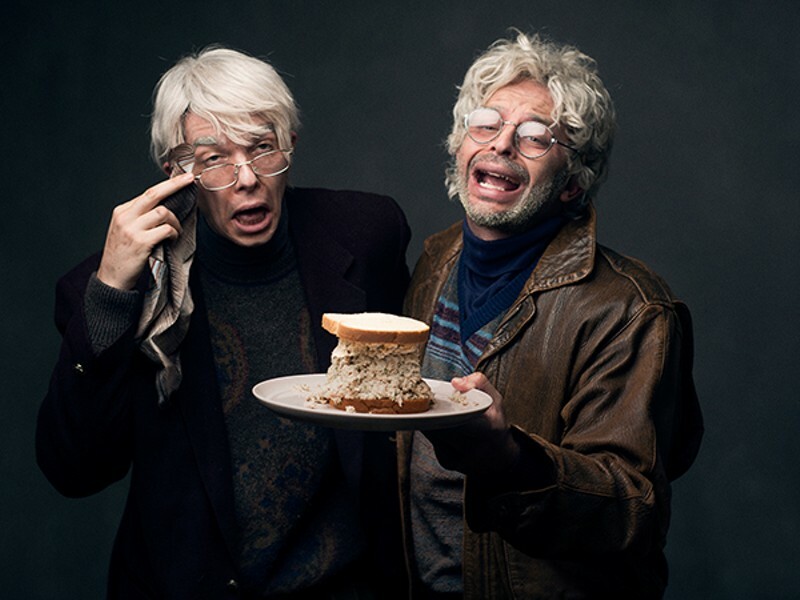 The duo came up with the idea for the pair of old, Jewish men in the early 2000s, and after a brief stint off-Broadway with their show Oh, Hello, Kroll and Mulaney are touring the country so that Faizon and St. Geegland can see America. I talked with Kroll and Mulaney about Gil and George's fascination with The Bachelor, Mulaney's desire to be Jewish, and what it's like on the road. First things first, seeing you guys on Bachelor Live as George and Gil was the greatest piece of television I've ever seen. 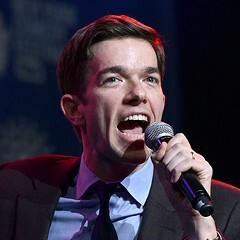 John Mulaney: Yes, it was. Nick Kroll: George and Gil didn't know it was a reality show—they thought it was a dramatic show. They just really liked it and wanted to get on it and give their opinions. They just kept bothering the booker, and the booker relented. That's the thing about George and Gil, they're so annoying that people eventually just give up and let them do the thing they want to do. JM: The Bachelor was right up their alley because that's the way it was in the 70s. They had a Spanish-style house with 40 women and they gradually alienated those women and made them cry. NK: And then broke off various engagements from the weakest ones, eventually. JM: And like the bachelor they realized that it's just fun to say "I love you," even if you don't mean it. What is George and Gil's origin story? NK: We have both in our own ways been interested in these kinds of guys for some time. Me, because I grew up with them; John because he hates that he's an Irish Catholic kid from Chicago and always longed to be an old Jew from New York. JM: I wanted to be at the Thanksgiving dinner in Hannah and Her Sisters so bad. JM: Nick is one of Mia Farrow's 15 children. NK: We saw these two older men at a bookstore and they were both buying Alan Alda's autobiography, Never Have Your Dog Stuffed. We followed them and watched them read that book together, each their own copies. They were the personification of the kinds of guys that we had been obsessed with. We started talking to each other like them in our free time. Then we hosted a show together in New York at Rififi, where a lot of us got our start in comedy, and we started hosting a show together as those characters. We just started building it out from there. JM: A lot of characters comedians do, if it's a comfortable fastball, you're happy to kind of do it forever. We tried other things at those Rififi shows that now I don't quite remember. This was the one that stuck. NK: We started doing them live and interviewed people. Honestly, it was just, we were talking like them in our free time, so why don't we just make this bit sort of useful and put it onstage? We started making a few taped pieces of it, then when I got my show [The Kroll Show] it just seemed like an obvious place for it. From there how did you decide to put together the Oh, Hello stage show? JM: On my end of it, I remember someone asked me what I was going to do next when I had nothing lined up, and I said, "Oh, Hello on Broadway." Then I was like, "Oh yeah, we should do that." NK: We had been with those guys forever and we were like, well, this is the most fun thing to do, and it's also sort of the most illogical thing to do. And yet it's always been, What's the stupidest thing they could do? The most ridiculous thing is for these guys, who can barely sneak into a Broadway show, to be in their own Broadway show that they have written. So we just started with that idea and have been working backwards toward that. So is the show actually scripted or is there a lot of improv with the characters? JM: A lot of it's scripted but we have different sections where we know we're going to improvise every night, and being on tour we pretty much improvise where we want all the time. We have a wonderful stage manager who knows that if we just start improvising that's just what we're going to do and not to darken the stage. NK: Each city we've gone to, we have a very scripted show, but then we are acclimating and playing. It's fun to write jokes to each new city we're in, so the show in D.C. has different jokes than San Francisco and Boston and Chicago. We'll have a lot of stuff that's specific to Chicago. One of the most fun things about George and Gil is that they're pretty effective joke tellers. It's easy to write jokes in their voice. How did you guys decide to take the show on the road? NK: It was announced that we were doing a show in New York, and we sold out the run in six hours. As we were posting about it we just kept getting, "Oh, man, we want George and Gil to come to Chicago" or wherever. It felt like there was a demand for this, and George and Gil have never really seen the country. They're banned from Greyhound buses and won't take the train and riding forward in cars makes them sick. [Laughs.] So we thought, let's take them on the road. They'll share hotel rooms. JM: With the Durst investigation open in New York they need to leave town for a little while. John, I know you just filmed your latest special in Chicago. JM: Yes, at the Chicago Theatre. NK: I didn't know you did a special. JM: I sent you a disc, remember? NK: I don't have a disc player anymore. JM: It's in your mail pile. NK: Oh, OK, I'll look. That's great, congratulations. How does it feel bringing each new project back to Chicago as you get more and more successful? JM: It was really cool to do the Chicago Theatre show because it was the end of a long tour that had me all over the country. It timed out nicely that the last show was in Chicago and doubly perfect that it was at the Chicago Theatre. You know, George is coming to Chicago for the first time as a failure, whereas I come back as a success. He's a failure staying in a men's hotel in Uptown—not the same kind of glamour. NK: Are there any sights that you're excited to take George to see while he's in town?